I have to admit, we don’t cook too many different types of veggies when we are on our own but since my parents came here we always have vegetables in every meal. Normally my mum cooks them and I am trying to learn how to cook them :). 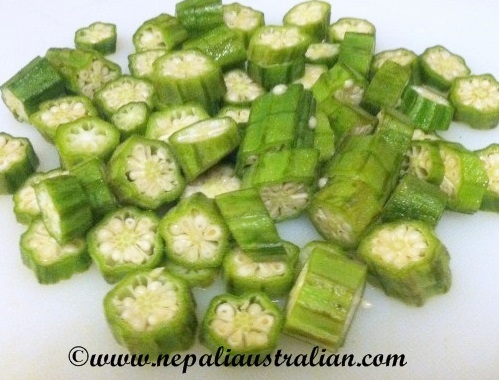 Here is an easy recipe for Okra (lady’s finger). I know it might not be everyone’s favourite but it tastes so yummy when done the right way. I am not a big fan of it either but when my mums make it I just love it :). Just remember not to add water. Wash the okra, dry them, chop and throw away tip and tail ends. Chop into 1/2 inch pieces. In a pan, heat oil and add cumin seeds and let them brown. Add garlic paste and let it fry for a few minutes, stir them for few seconds. Add turmeric powder and add okra and mix well. Fry on medium high heat for 3-4 minutes stirring occasionally. Add salt and reduce to low flame and cover it and cook for 15 minutes stirring occasionally. The okra is cooked when it turns soft. This entry was posted in Recipe and tagged australian, M from nepaliaustralian, Nepal, Nepali, nepali food, Nepaliaustralian, vegetarian. Bookmark the permalink. I love okra (or bhindi to me) ❤️! Okra is not a vegetable I eat a lot of, but this looks pretty good! I haven’t yet – but I think I will! 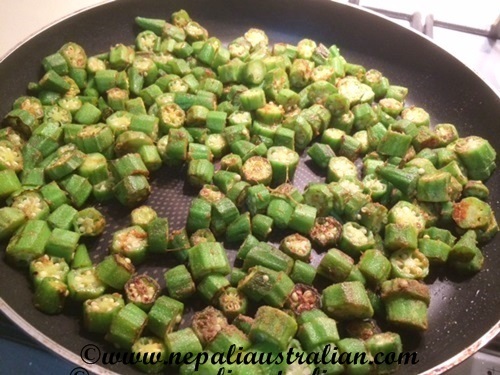 We usually make it with onions…actually we call it ‘bhindi do pyaaza’ which literally means okra with onions in 1:2 ratio. It is a favorite in our household. I am goona try that. Will it be gravy or dry? No okra to be found here 😦 I didn’t like that much in Nepal, but of course now I miss it since it’s not found here 😛 The recipe sounds SO easy and I am surprised your mum doesn’t use any extra spices except garlic paste and turmeric. Not even curry powder? I would love to try out this recipe, but dunno when. we can buy frozen okra in Asain grocery store, check it out. They taste bit different than fresh but still good. This one is a classic and quite a favourite in our house. Though we usually like the okra a little crisp..